We've watched SMIT's Solar Ivy project grow since it sprouted as a startup a few years ago - and now the solar technology firm is getting bigger and better. 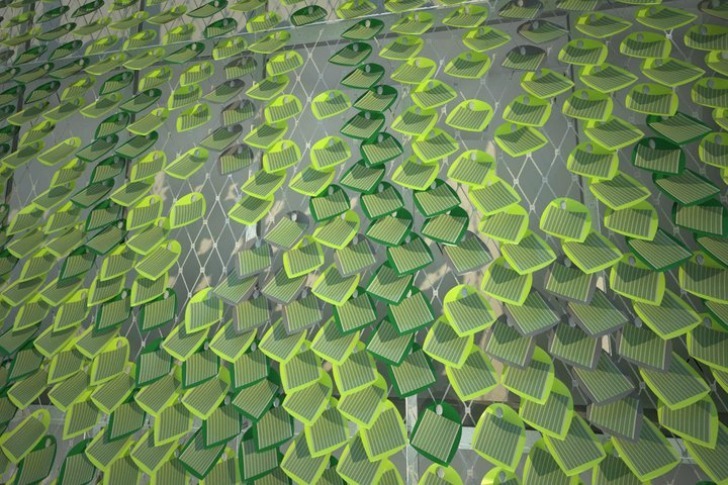 SMIT, which stands for Sustainably Minded Interactive Technology, began turning heads with its leaf-like photovoltaic panels that generate power using both the sun and the wind. Designed to be totally modular and easily installed on any building, Solar Ivy now comes in a range of colors, leaf shapes, and photovoltaic panel types. The company has a number of installations on the boards and is currently taking orders for the first commercially available version of Solar Ivy. Solar Ivy is a modular and customizable photovoltaic product with a wide range of applications. The “leaf” is roughly the size of a cantaloupe with a thin-film photovoltaic panel adhered to it. Customers can choose either an organic photovoltaic panel, which is completely recyclable, contains no toxic materials, and costs about $18 per watt, or a CIGS panel, which is the most efficient type of thin-film on the market and costs roughly $9 per watt. After selecting a PV type, customers can choose the leaf’s color shape depending on how they want the system to look when integrated into their project. SMIT works with their customers to customize the installation and optimize the solar energy generated depending on the requirements and environmental conditions of the project. To set up a Solar Ivy system, first the building interface is attached and a steel wire mesh is installed. The steel mesh can bend, curve or stretch to match any contour, and the leaves can be positioned for varying densities depending on window placement and exterior shading. Individual leaves can be replaced as technology improves or if one becomes damaged. The system provides renewable energy for the building using the sun and breezes while also serving as a shade screen that minimizes solar heat gain. Currently, SMIT is working on a number of installations set to proceed sometime this year. The University of Utah has secured funding to install Solar Ivy on the south-facing facade of the Orson Spencer Hall building. SMIT is working with Science World Vancouver to develop an innovative new exhibit space and will install a Solar Ivy wall at the Environment Museum of the Montreal Biosphere. There are also plans for a residential application as well as a screen on a parking garage, and now the company is taking orders for more projects. SMIT is also working on a tensile solar shade. I looked at all the pictures above. They look more like thousands of tiny little fly swatters and why cover the pretty townhouse with thousands of sticky notes. Maybe they serve as reminder that grid electricity is cheaper than solar or the fact it does help to hide the uglier buildings. 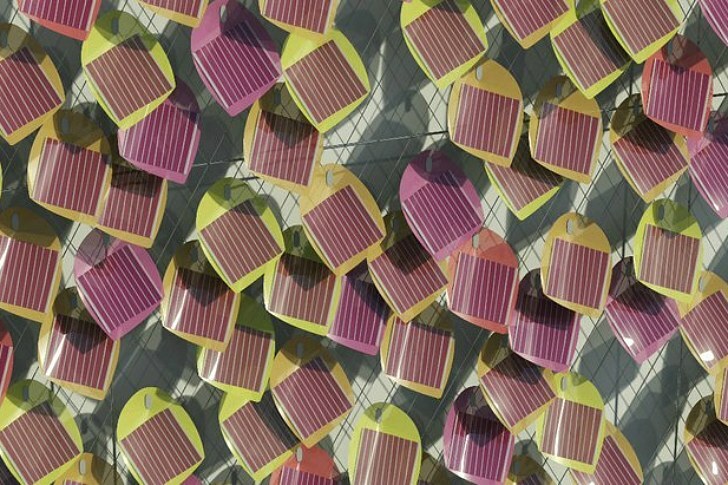 Solar Ivy is a modular and customizable photovoltaic product with a wide range of applications. The "leaf" is roughly the size of a cantaloupe with a thin-film photovoltaic panel adhered to it. Customers can choose either an organic photovoltaic panel, which is completely recyclable, contains no toxic materials, and costs about $18 per watt, or a CIGS panel, which is the most efficient type of thin-film on the market and costs roughly $9 per watt. After selecting a PV type, customers can choose the leaf's color shape depending on how they want the system to look when integrated into their project. SMIT works with their customers to customize the installation and optimize the solar energy generated depending on the requirements and environmental conditions of the project. To set up a Solar Ivy system, first the building interface is attached and a steel wire mesh is installed. The steel mesh can bend, curve or stretch to match any contour, and the leaves can be positioned for varying densities depending on window placement and exterior shading. Individual leaves can be replaced as technology improves or if one becomes damaged. The system provides renewable energy for the building using the sun and breezes while also serving as a shade screen that minimizes solar heat gain. Currently, SMIT is working on a number of installations set to proceed sometime this year. The University of Utah has secured funding to install Solar Ivy on the south-facing facade of the Orson Spencer Hall building. SMIT is working with Science World Vancouver to develop an innovative new exhibit space and will install a Solar Ivy wall at the Environment Museum of the Montreal Biosphere. There are also plans for a residential application as well as a screen on a parking garage, and now the company is taking orders for more projects. SMIT is also working on a tensile solar shade. 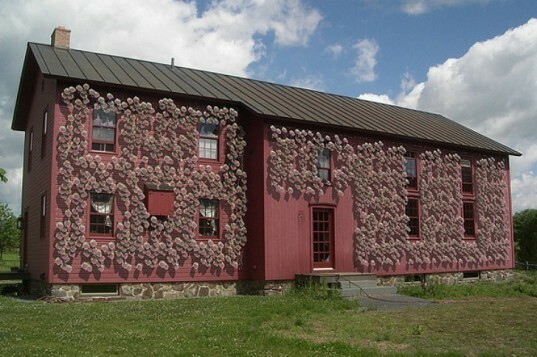 Early generation of GROW Solar Ivy.